Took the kids round to our local shops the other day (one of the two or three days we had sunshine up here) and we stumbled across these poppies growing wild next to our train station. They were so pretty I had to take their picture despite the scrubby ground all around them. The ground is this way because last year the station was done up and the ground in the little park next to it was churned up by the machinery being used to do up aforementioned station. 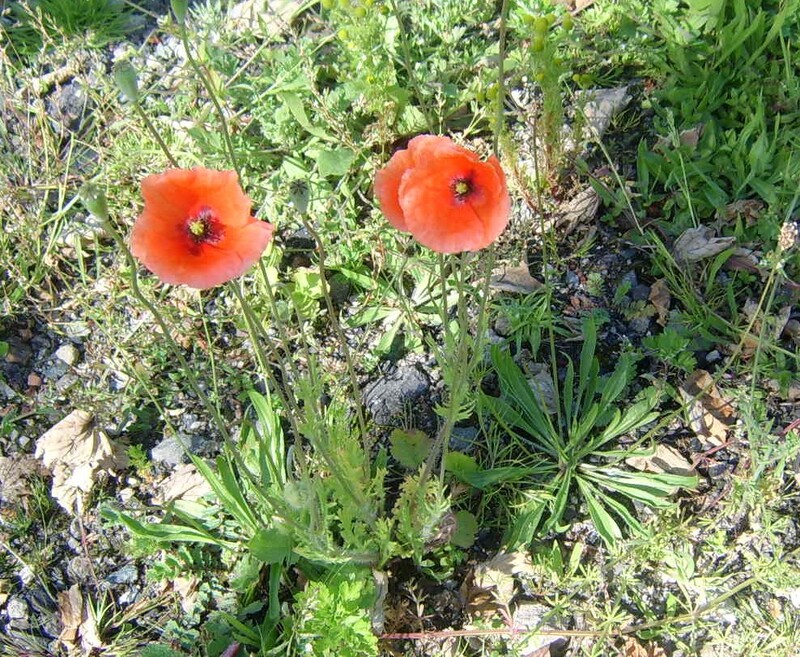 What’s left (in that part of the little park) is an exceptionally stony piece of ground…with poppies growing on it! So it’s not all bad. The good thing about making handmade goodies is that you can often do things that are completely handmade (ie not using a sewing or knitting machine). 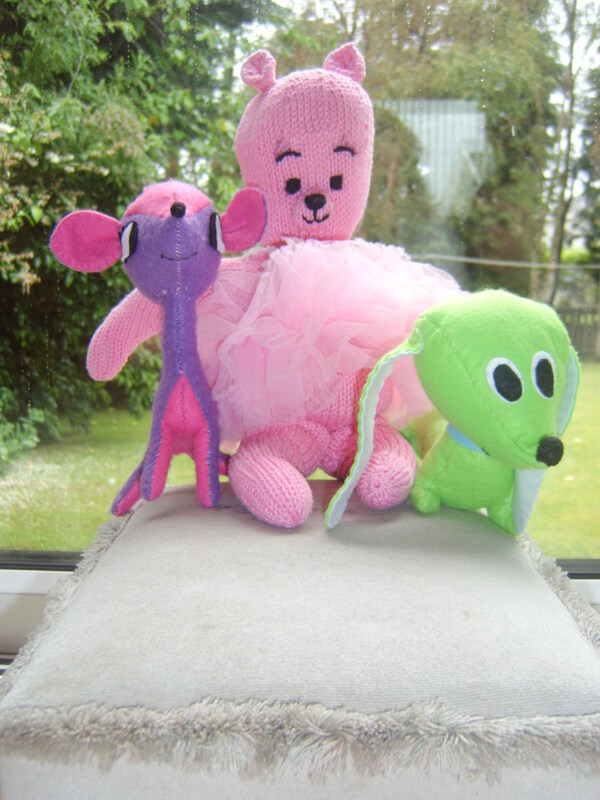 Above are the three toys I’ve recently finished for the kids whilst sitting in front of the telly at night (pining the loss of Game of Thrones…hope it comes back soon!) watching Castle or the American Office or Pawn Stars or Gold Rush (we’re on an American programme trip right now cos I personally feel there is NOTHING on UK tv that’s worth watching at the moment – if you disagree, let me know. Oh, with the exception of Horrible Histories, which is funny. We’ve even stopped watching the soaps, so bored are we with the storylines). Anyway, Ruby is the pink bear and I made her by rejigging a pattern I found in a knitting book. I think she turned out really nice. The other two (Angel is the deer, Freddie the dog) are from this book. I hand stitched them. The only problem was that I didn’t have thread to match the felt, so have had to make do with what I had. I think they turned out okay though. This week I’ve been off on annual leave and trying to entertain the kids. So far we have had a friend of the girl’s over for a sleepover (they were still awake after 11pm and got up at 5am – sigh), we went to Geilston Garden for walk around, had lunch at McDonald’s (a treat they don’t get often), went to GoMA for an art class (the girl drew a bird, the boy had me draw a cow that I must admit looks awfully like a pig), had a picnic lunch at Glasgow Green and played in the swing park, went to Mandor’s in Glasgow for material for me to make them a tepee from a pattern from this book. I have a couple of other things to do this week and then I am done! Next week I AM DOING NOTHING! I really need a break (ie just slouching around the house), but I’ve had invitations to do stuff with the kids from friends this week (which has been great) so haven’t been able to. Next week I am doing it, I am going to be the Queen of Slouching (well as much as you can be with two active kids)!! Besides, I really need to get on with writing DI3. Right am off to get dressed. The girl has a play date with her friend round the corner, so need to take her there. See ya!